$2000 per person deposit required. Due to the high price of hotel and train accommodation in Russia, if you join our share program and we fail to pair you, a mandatory up-charge equivalent to the full supplement will apply. Optional Single Supplement: $900 USD (number of singles limited). This tour may require a mandatory single supplement charge of $900 if you join our share program and we are unable to pair you. "Russia. The country conjures up so many images and stereotypes. Iconic architecture, vast Siberian forests, Soviet-esque socialist realist art, autocratic leaders, the home to famous authors and composers, vodka and caviar, and more. A land mass that is almost double that of Canada (the second largest country in the world) leaves one overwhelmed by the prospect of visiting and doing justice to the whole Russian experience. This tour offering is designed to try and tackle just that. When I first began to consider this tour I wished to offer more than the typical "core Russia" tour offered by a number of other companies. The project grew to a scope that we now offer to you in two different modules, featuring St. Petersburg, the Russian Arctic and Moscow and the Golden Ring, followed by a train-based journey from Moscow to Vladivostok with many stops along the way, followed by an optional add-on to the wild peninsula of Kamchatka at the end. The whole tour lasts 7 weeks, a very ambitious prospect. What will you experience? Think stately St. Petersburg, energetic Moscow, remote villages along the shores of the Barents Sea, classic onion-domed churches along the trail of the Golden Ring, and riding the Trans-Siberian route to the shores of Lake Baikal with stops in Kazan, Ekaterinburg, Krasnoyarsk and more! For those with the inclination for true adventure, the week-long add-on to Kamchatka is not for the faint of heart, as it will feature hiking, wilderness adventures, and (weather-permitting) a helicopter ride over the Geyser Valley and Uzon Caldera. I welcome you to come experience what Russia has to offer with me." Arrive in St. Petersburg, Russia. St. Petersburg is a relatively new city, founded in 1703. When it was nine years old it became the capital of Russia and retained this status till 1918; even now it is referred to as the "Northern Capital" of Russia. Over almost 300 years	of its history St. Petersburg accumulated all the grandeur of the Russian Imperial Court and became one of the largest centres of culture, science and industry. Created by Peter the Great as a sea port on the Baltic it was essentially "a window to the West" for Russia, combining the best of the West and the East. We kick off our sightseeing* this morning with a visit to the Peter and Paul Fortress. We'll see how the fort played an important role in the development of St Petersburg, which makes it a good place to begin our visit. This was the first structure to be built in St. Petersburg, and thus the birthplace of the city, but it never served its intended defensive function. Instead it has had a rich, hugely varied, and sometimes sinister history as a military base, a home of government departments, the burial ground of the Russian Imperial family, the site of groundbreaking scientific experiments, and a forbidding jail that held some of Russia's most prominent political prisoners. We then continue to Peterhof Palace (Petrodvorets), a remarkable example of an eighteenth and nineteenth century country estate. Built by Peter I in 1717, the palace was to be "better than the French king's at Versailles." An intricate	system of water fountains surrounds the palace in the immaculate gardens. We will have a chance to walk through the palace and the gardens. We return to the city by hydrofoil (weather permitting). * The order of our St Pete's (and Moscow) activities is partly dictated by the days on which all of the sites visited have their weekly closures. In order to ensure that we place each element accordingly may mean that logic, according to theme and as dictated by the map, may suffer as we hop about from place to place. This morning we'll visit the Church on the Savior of Spilled Blood, a marvellous Russian-style church was built on the spot where Emperor Alexander II was assassinated in March 1881. After assuming power in 1855 in the wake of Russia's disastrous defeat in the Crimean War, Alexander II initiated a number of reforms, freeing Russian serfs (peasants, who were almost enslaved to their owners) from their ties to their masters, and undertook a rigorous program of military, judicial and urban reforms, never before attempted in Russia. The decision was taken to build a church on the spot where the Emperor was mortally wounded. Next we explore one of the world's leading museums, the Hermitage (main building). With over 400 exhibition halls, it is virtually impossible to list all of the treasures. While walking through the many galleries, look out for Madonna by Raphael, Judith by Giorgione, Titian's Saint-Sebastian, and many, many paintings by Rembrandt. Inside this beautiful	Winter Palace are some of the finest collections of French impressionist works. In addition, there is a fine collection of ancient and classical works from ancient Egypt, Syria, and Mesopotamia. One could easily spend several days wandering the halls inside the building; for the purposes of our formal guided tour today, we concentrate on the highlights and provide an orientation to those wishing to explore further on their own during some designated free time. You are welcome to remain in the museum and make your own way back to the hotel on your own. The afternoon is yours for independent exploration (dinner on your own this evening). This morning we check out of our hotel and travel to Pushkin to see the sumptuous Catherine Palace, created in the eighteenth century by Catherine the Great, the second wife of Peter III. Designed by Rastrelli, this palace is a truly stunning example of classical baroque architecture and interior design. The true glory of the palace is the Amber Room, made of several tons of the golden tree resin -- the lightest gem in the world. The room was first installed in the Winter Palace, but in 1755 Empress Elizabeth ordered Francesco Rastrelli to move it to the Catherine Palace. Returning to the city we'll stop at St Isaac's Cathedral, where we will notice the interior reliefs of exceptional beauty. We will also hear of the many legends that make this church famous throughout Russia. Our last stop is the Russian Museum. The museum opened in 1898 by Alexander III in the beautiful Mikhailovsky Palace -- well worth inspecting before we take a look at the collection inside. Works of Russian art abound with over 370,000 pieces in the collection. There are prized paintings, sculptures, iconographic art and several masterpieces. It truly is an encyclopedia of Russian life, character, and soul, which sets us up well for things to come. We then return to St Pete's with some time to prepare for our first overnight train to Petrozavodsk for the northern/Arctic section of our program. ABOUT THE TRAINS (Western Russia segment): We will book 1st class cabins (DBL room) for the segments St Pete’s-Petrozavodsk and Kem-Murmansk. Limited single cabins available. Russian classification of the wagons: 1st class wagon consists of 9 cabins with two beds in each. Beds are low (both) and there is a table between them. There is plenty of space to keep your luggage in the compartment (cabins are lockable), either in an overhead luggage storage area, or under the bed. There are two toilets in each wagon; there are no showers in any of the trains. We will provide a more detailed info sheet on the trains upon reservation. Welcome to Petrozavodsk, located at 61.7782° N.
At around 7am we disembark our train and head to a restaurant for breakfast. Please be prepared with everything you will need for the day as we will not be arriving at our hotel until the end of the day's activities. We first tour the city centre of Petrozavodsk where we will be acquainted with its more than 300 year history. Founded in 1703 on the bank of Lake Onego, Petrozavodsk played an important role in defending the borders of the Russian Empire. In 1777 Petrozavodsk was granted the status of a town and soon became the capital of the area. The name of the city is derived from a factory of Peter the Great that was famous for its cannon and iron casting. The Petrozavodsk factory was well-known, not only for producing high quality weapons, but also for exquisite iron cast fences. Some works still decorate parks and bridges of St. Petersburg. During WWII Petrozavodsk was heavily damaged, hence the majority of today's city centre was erected soon after the war in a unified architectural style known as Socialist Classicism. The city also boasts of many parks and green spaces. We'll stop at Onego Lake, which offers picturesque views an open-air museum of modern sculpture. Late morning we'll board a hydrofoil for Kizhi Island (about 1h 20 min). On arrival we'll visit the Kizhi State Open-Air Museum of Wooden Architecture, one of the most popular attractions in Russia. The pearl of the museum is its world renowned wooden church ensemble (presently under restoration), a UNESCO World Heritage Site since 1990. Kizhi Island is a place of rare beauty, where nature and wooden architecture coexist in full harmony and revive a unique atmosphere of the past. Later this afternoon we hydrofoil back to Petrozavodsk arriving in time for hotel check-in and dinner. Today we check out and travel by road to Kem (please pack your day bag with everything you will need for the day). En route we stop at the Kivach Nature Reserve. We will see a waterfall and become acquainted with typical local flora and fauna at the site museum. We also see the Belomorsk Petroglyphs, an archaeological complex comprising over 2,000 images of wild animals, sea animals, and people, including the world's oldest images of a person skiing.Our visit will reveal much about the Karelian past and mysteries of the early Stone Age peoples. Later we arrive at Kem and check in to our hotel. This morning we travel by ferry to Solovki. On arrival we'll transfer to our hotel to drop our luggage (it will be too early to check-in, so please have everything with you for the day). The Solovetsky Islands, or Solovki, comprise an archipelago of six islands located in Onega Bay of the White Sea. The only inhabited locality on the island is the settlement of Solovetsky (pop 1,000), which serves as the administrative centre of Solovetsky District. Historically the islands have been the setting of the famous Russian Orthodox Solovetsky Monastery complex, which is the highlight of our day and the main attraction on the island. It was founded in the second quarter of the 15th century by two monks and, by the end of the 16th century, the abbey had emerged as one of the wealthiest landowners and most influential religious centres in Russia. 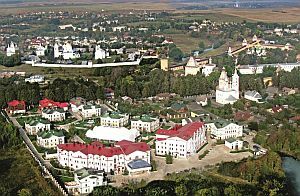 This imposing, stone-walled monastery has played various roles throughout its existence: a hermit's retreat, a vibrant religious community, a rebel enclave that held out against the Patriarch of the Russian Orthodox Church, a fortress victorious against British warships, a gulag for the Soviet Union's damned and a museum. Revived post-perestroika, it flourishes once more as a spiritual institution. After the October Revolution, the islands also attained notoriety as the site of the first Soviet prison camp (gulag).The camp was inaugurated in 1921 while Vladimir Lenin was still at the helm of Soviet Russia, and was closed in 1939 on the eve of World War II. By the beginning of the war, there was a naval cadet training camp for the Soviet Northern Fleet. the highest point of the island. Situated on the top of the hill is one of the strictest sketes (monastic community) of the island with a unique lighthouse church. During the gulag time the skete was one of the cruelest of all the detention places for the inmates of the camp. Today it is a living skete again; a very tranquil place that offers a fantastic panorama view over the island. This morning we check out (please pack your day bags) and travel by boat to Bolshoi Zayatsky, a small rugged island covered with boulders, moss, and large bushes. The island is best known for its 'labyrinths' as well as more than 850 heaps of boulders and numerous other stone settings. Labyrinths, for the most part, are formed by boulders set in a row. The boulders are not especially large (roughly 30-40 cm in diameter), and the rows are twisted in the form of a spiral; often there are two spirals set one into another. The purpose of these stone settings is unclear. It may be assumed that the labyrinth was used for specific rituals to help the souls of deceased travel to another world. Another hypothesis is that the stone settings served as a model for complex fishing equipment. In the mid-afternoon we ferry back to Kem where we have dinner before catching our overnight train north to Murmansk. This morning we arrive in Murmansk, meet our local guide, and enjoy breakfast at a local restaurant. Welcome to the world's largest city above the Arctic Circle! (68.9585° N). Murmansk’s raison d’être is its port, kept ice-free by comparatively warm Gulf Stream waters. 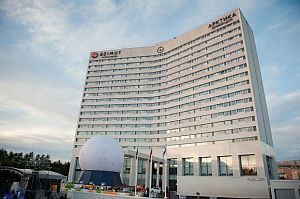 This bustling, rapidly modernising place gets much of its wealth from the cornucopia of minerals found beneath the ground of the Kola Peninsula, the controversial exploitation of natural resources in the Arctic and close ties with its Scandinavian neighbours. During World War II (known in Russia as the Great Patriotic War), Murmansk served as a port for the Arctic convoys, and after the war became the Soviet Union's most important submarine base. As a relatively new entity, Murmansk has few real sights apart from the giant statue Alyosha, a 30-meter-tall statue of a soldier built in 1974 to commemorate the Soviet defence of the Arctic during World War II. Architecture buffs will, however, be intrigued by the crumbling but Stalinist architecture downtown. We'll have panoramic look around Murmansk and pay a visit to the nuclear icebreaker, Lenin. The ship was retired in 1989 having covered more than 500,000 nautical miles (about 925,000 km or 575,000 statute miles) in ice. In 2009, around the 50th anniversary of its entering service, it opened as a floating museum in Murmansk harbour. Today we leave Murmansk for an excursion north to the Arctic Ocean and the village of Teriberka, the capital of Kola Peninsula and Murmansk region (69.1827° N). This wild place became famous after the release of Oscar-nominated movie, 'Leviathan' by Russian film director Andrey Zvyagintsev, which featured the dramatic scenery of the Arctic Ocean coast. The film also depicts troubling aspects of modern life in Russia: the arbitrariness of officials, wrongful courts, hypocritical bishops, greedy boss-managers, mindless drinking, and wandering. Our route passes through Arctic tundra, a vast treeless area also typical of Canada and Greenland, with a severe climate throughout the year (dress accordingly!). Teriberka was once home to Pomor settlers and is proud of its maritime heritage, which peaked after the Second World War when big boats brought in catches of cod and haddock and the population reached 5,000. The village fell into slow decline as industry moved to bigger ports, and the economic collapse of the 1990s almost finished it off. Today the population hovers around 900 but remains one of the most picturesque spots in Arctic Russia, with its skeletons of old boats on the shore, wooden cabins, empty shells of Soviet-era housing and a colourful seafront graveyard. Before returning to Murmansk, we'll include a spectacular heli-sightseeing flight along the rugged Arctic coast (+/- 25 min, weather-permitting). The Golden Ring is a ring of cities northeast of Moscow formerly comprising the region known as Zalesye. These ancient towns, which also played a significant role in the formation of the Russian Orthodox Church, preserve the memory of the most important and significant events in Russian history. The towns have been called "open-air museums" and feature unique monuments of Russian architecture of the 12th-18th centuries. These towns are among the most picturesque in Russia and prominently feature Russia's onion domes. Of course this means that the visitor must brace oneself for an itinerary heavy on monuments, churches, cathedrals etc, which, of course, are important definitive aspects of the place of which the Russians are rightfully proud. As we go, however, we'll also try to put this interesting region into a larger context and experience the not-so-distant past and the present, and discuss its prospects for the future. And of course such discussions, at least according to our hosts, always go better with plenty of medovukha, a local specialty wine made from honey. Our destination is Vladimir, founded by Prince Vladimir Monomakh in 1108. In 1157 Prince Andrei Bogolyubsky moved the capital of Vladimir-Suzdal Principality to Vladimir because of the sacred icon of Our Lady from Constantinople having been moved there. In 1299 the town also became the residence of the Russian Metropolitan. By the middle of the 14th century Vladimir had lost its political importance and Moscow had become the main political centre of the Russian state. The ancient monuments dated by the 12th century remain in town and its suburbs. We visit the main shrine of Vladimir, the majestic and beautiful Assumption Cathedral. Once it was the main church of Vladimir principality. Its construction was initiated by the glorious Prince Andrei Bogolyubskii in 1158. We also include the Cathedral of Saint Demetrius , considered as a premier monument of ancient Russian architecture. History has not preserved the names of the builders of this wonderful church, but we know the approximate date of its laying, c. 1194-1197. We finish with a look at the Golden Gate arch, a unique example of Russian military architecture of the 12th century. It was erected in 1164 as a part of the defensive wall encircling the ancient Vladimir. Today our adventure continues to Bogolyubovo, located on the high bank of river Nerl. The legend says that Prince Andrei Bogolyubsky saw a vision of the Virgin Mary who ordered him to found a temple at the mouth of the rivers Nerl and Klyazma. We stop in at the St. Bogolyubskiy Monastery and Church of the Intercession on the Nerl before continuing to Suzdal where we embark on a panoramic tour. In full, "Suzdal Principality," in Russian "Suzdalskoye Knyazhestvo," this medieval principality occupied the area between the Oka River and the Upper Volga in northeastern Russia. During the 12th to 14th centuries, Suzdal was under the rule of a branch of the Rurik dynasty. As one of the successor regions to Kiev, the principality achieved great political and economic importance, first becoming prominent during the reign of Andrey Bogolyubsky, who conquered Kiev (1169) and transferred the title of "grand prince" from that ancient capital first to Suzdal, then to Vladimir, his new capital on the Klyazma River. We make an excursion to the Kremlin, where we find, among other things, the remnants of Suzdal's first stone church, built in the 12th century. Also located in the Kremlin are the main belfry and the snow-white Archiepiscopal Palace. In its day, Suzdal was the spiritual center of Old Russia, and this is evident even now. Over an area of 3.5 square miles there are five monasteries, some 30 churches and chapels, and 14 bell towers: More cultural artifacts per square foot than anywhere else in the world, with the possible exception of Old Jerusalem. Given the seasonality of our visit, you no doubt will have noticed that gardening has long been one of the main occupations of the local dwellers (true throughout Russia). The main crops in Suzdal are horseradish and cucumber, and today the cucumber has become one of the city’s brands. In addition to traditional cucumber pickles, in Suzdal you will be treated to the most unexpected cucumber dishes. Today we continue to Kostroma, established in the 12th century. During the time of Polish-Lithuanian intervention in the beginning of the 18th century, Kostroma played a prominent role in the formation of people's volunteer corps led by Minin and Pozharsky. Another representative of Kostroma, peasant Ivan Susanin took enemies to thick woods and deadly swamps where they all met their deaths. On arrival we have a break for lunch -- note: Kostroma is famous for mushrooms and mushroom dishes, often featuring a cream sauce, sprinkled with grated cheese and baked until golden brown. This afternon we take a (short) break from cathedrals and monasteries with a visit to Sumarokovo Moose Farm, an experimental facility where a herd of moose is kept for agricultural purposes. The idea of the moose domestication did not get much traction in Czarist Russia. However, it reappeared in the 1930s Soviet Union; it was suggested at the time that moose cavalry could be efficiently used even in the deep snow. In 1934, the Soviet Government's Nature Reserve Committee ordered creation of moose reserves and moose breeding centers. However, the work was not finished in time for World War II, and when the war came, the entire idea of cavalry as a combat force was swept away. Today the moose are kept primarily for milk production; the farm supplies moose milk to a nearby sanatorium. Moose antler velvet can also be harvested and used for several pharmaceutical products. Farming moose for meat has been tried but almost immediately abandoned, as the moose, who are allowed to range freely, are not stupid and would never return willingly to a place where it's kin are being killed and slaughtered! This morning we have a panoramic tour of Kostroma, whose centre comprises buildings and structures built in a classic architectural style during the period between 1770-1830. It's a fine example of unique, monolithic urban architectural complex. We include the exteriors of the Church of the Resurrection on Debre and the Epiphany Monastery before heading off to Yaroslavl. After a break for lunch we'll continue to Yarolslav and check-in to our hotel. During free time in this region, keep an eye out for "black salt" in local shops, or ask your guide. This is a unique product from Kostroma region, which has dark grey crystals and a charming bread-like smell achieved by roasting in special ovens with flour and wild herbs. Compared to regular table salt, black salt has an increased content of minerals (iodine, calcium, potassium, magnesium and others), and less sodium, and is believed to have medicinal qualities. Yaroslavl is older than Moscow, established about 1010 by Prince Yaroslav the Wise at the bank of Volga River. In the 17th century, Yaroslavl was the biggest trade and industrial town of Russia. During this time many new buildings were built, such that the town now has its own school of architectural styles and construction. Indeed the successful merchants in the town tried to out-do each other in their contributions to the city's architecture, encouraged by the city's architectural school. This morning we'll have a tour about Yaroslavl seeing the principle monuments before a break for lunch in town. Keep an eye out for "fish pies," a typical dish of Yaroslavl. This afternoon we'll enjoy a relaxing cruise on the Volga River (dinner on your own this evening). On our last day on the Golden Ring we stop in at Rostov-the-Great and Sergiyev Posad before finally arriving in Moscow. Rostov is one of the oldest cities on our route, situated by the beautiful Lake Nero. The history of this place begins four thousand years BC when the first tribes stayed next to the lake. Until the 11th century the territory of Rostov was inhabited by the Finn-Ugors, or 'Meryans' people. Slowly they assimilated with the Slavs, who came from the south. On arrival we will have a tour of the town, including the Rostov Kremlin and Museum of Enamel. After lunch and some free time in Rostov we transfer to Sergiyev Posad ("Zagorsk" in Soviet times), which developed from a settlement around the Troitse-Sergiyeva Lavra, one of Russia's most famous monasteries (founded 1340). In 1774, the monastery was given the title Lavra, the monastery of the highest rank, and played an important role in the history of the formation of the centralized Russian state and in the development of the Russian culture. We will visit the monastery, which has currently become a place of pilgrimage of the Russian Orthodox Church. After our visit we'll continue to Moscow. Moscow is the 872 year-old capital of Russia. An iconic, global city, Moscow has played a central role in the development of Russia and the world. For many, the sight of the Kremlin complex in the centre of the city is still loaded with symbolism and history. Moscow was the capital of the former Soviet Union and signs of its previous life are still very visible. Yet, there is more to Russia and its capital than just memories of the USSR. Architectural gems from the time of the Russian Empire are still dotted throughout Moscow, while signs of modern Tsars (or at least people with similar levels of wealth) abound. Today we will tour famous Red Square, once the centre of Soviet life. Around the square is the History Museum, the Tomb of the Unknown Soldier, and the Lenin Mausoleum, which was built in 1929. In the 16th century, Ivan the Terrible ordered the construction of one of Moscow's most famous landmarks -- Saint Basil's Cathedral. Originally called Pokrovsky Sobor (the Cathedral of the Veil), each of the nine cupolas cover a chapel named after the saint on whose feast-day the Russian armies won their battles. This afternoon we visit a unique treasure house of Russian painting, graphs and sculptures --the Tretiakov Gallery. It has 62 exhibition halls representing the works of the XII century artists, sculptors, and icon painters. Here you'll see works of Brulov, Savrasov, Vasiliev, Kuindgi, Nesterov, Rublyov, and Ushakov. This evening you can choose to attend a Bolshoi performance (optional - details TBA). To facilitate this, we do not include dinner this evening. Today we have a walking tour of the Kremlin, the famous triangular-walled citadel of the Soviet Government dating from the end of the 15th century, with its many cathedrals and iconostases, the bell tower of Ivan the Great; and the Czar Bell, which weighing 200 tons is the largest in the world. Upon leaving the Kremlin, be sure to touch the Kremlin Wall -- an omen foretelling your return to this hospitable city. We also include a visit to the Kremlin Armory. While in Moscow we'll also visit the GUM Department Store, once filled with Soviet-era goods of mediocre quality, now a mall with international labels and hyper-expensive boutiques. Even if you don't buy anything, it's highly recommended to go inside and admire the architecture. This evening we'll have a farewell dinner for those travellers ending their journey in Moscow. We may also be meeting new travellers joining us for the Eastern section of our journey. 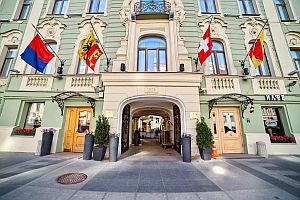 In an elegant, 19th-century mansion, this upscale hotel is a 3-minute walk from a metro station and 3.1 km from ...	Winter Palace, a former residence of Russian emperors. The warm rooms and suites have Wi-Fi, TVs, minibars, and tea and coffee making equipment. Solovki Hotel is just 7 minutes away from the Solovetsky Monastery and 3 minutes away from the coast of the ...	Sea, where the eminent Solovetsky labyrinths are located. 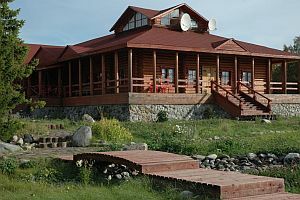 The territory of the hotel is a beautiful park complex, where the combination of branchy spruces, a small pond and cobblestone paved roads, and wooden buildings constructed in the traditions of Russian architecture. Set in an imposing building with views over Ploshchad Pyat Uglov Square, this trendy hotel is a 4-minute walk from ...	train station and a 6-minute walk from Murmansk Regional Art Museum. Featuring mood-lit headboards and geometric prints, the contemporary rooms provide free Wi-Fi and flat-screen TVs. 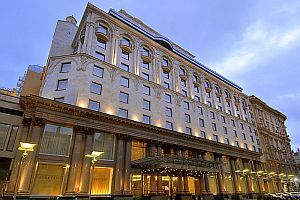 Overlooking the Klyazma River, this upscale hotel is a 11-minute walk from the Zolotye Vorota monument, 1.5 km from the ...	Kafedralnyy Sobor cathedral and 2.4 km from the train station. Ranging from woodsy-chic to refined, the warm rooms feature free Wi-Fi, flat-screen TVs and minibars. Breakfast daily (hotel & local restaurants). Many lunches (ie on trains and remote day trips) are included, as are most dinners. Due to logistics, timing, and the need to have a break now and then, we leave some dinners up to your own account (as per tour itinerary). All transport (including internal flight/s), accommodation, guiding, sightseeing and entrance fees for sites noted as 'visited' in the detailed itinerary. Gratuities for local guides, drivers, restaurant staff, train attendants, porters (when available). We include costs associated with acquiring your ‘visa support’ document from our partners in Russia (actual visa fees not included). Airport transfers for land & air customers and for early arriving/late departing land & air customers who book their extra hotel nights through us. International airfare to/from the tour. Tour Leader gratuities, some lunches/dinners (as per itinerary), alcoholic drinks, personal items (phone, laundry, etc), international air taxes (if applicable), and any activities referenced as 'optional'. Airport transfers for Land Only customers. Visa fees. Our post-reservation trip notes offer further guidance on optional meal costs and shopping. 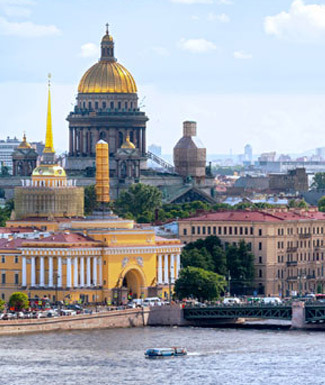 Our mid-late summer timing can expect summery temperatures in St Petersburg and along the Golden Ring to Moscow. At this time of year, daylight hours are long and one can expect t-shirt weather during the day and cool evenings/mornings. Summer can also feature humidity; it can also be a rainy time of year, though such rain usually falls in the form of short-lived showers. Up in Murmansk temperatures will reflect the northerly latitude, and our foray to the Arctic will be downright cold, especially in exposed locations and near the Arctic Ocean. Land transport (not rail) modes will vary from large touring coaches in major towns/cities, to smaller buses, multiple 4x4 vehicles, and possibly taxis here and there, ie to/from dinner. We will book 1st class cabins (DBL room) for all segments. Limited single cabins available. First class wagons consists of 9 scrupulously clean cabins with two beds in each. Beds are low (both) and there is a table between them. There is plenty of space to keep your luggage in the compartment (cabins are lockable), either in an overhead luggage storage area, or under the bed. There are two frequently cleaned toilets in each wagon (not in your cabin); there are NO showers on any of the trains. We will provide a more detailed info sheet on the trains upon reservation. Our "level 3" difficulty rating (though usually reserved for our active hiking trips) reflects the scope and length of our tour, the tremendous amount of moving around we do, and the number of stops en route, such that this can be considered a moderate-strenuous tour that should not be undertaken lightly. Though we do not have any actual active activities/hikes built into our program, this is a demanding tour from the standpoint of the fullness of our days, the overnight trains on which sleep may suffer, the lack of creature comforts (trains), one-night stays, long road journeys, and the remoteness of several locations. You will also note from the tour itinerary, that some days have us arriving at destination in the morning and embarking immediately upon our sightseeing program, not checking-in to our hotel until later in the day. Though every effort has been made to make this trip as comfortable and well-paced as possible, if you have any physical impairments, rely on a cane or any other mobility aid, or have any medical conditions that require that you have easy access to specialized medical care, we regret that this tour will not be suitable for you. Likewise if you have strict dietary restrictions/preferences, you will likely be frustrated on this tour. Russian cuisine is very well-prepared and served, fresh, and plentiful, but it tends to be very ‘meat and potatoes’-based and rather repetitive. Vegetarians should be okay with limited options, but things like ‘gluten free’ or vegan, for example, will likely be challenging to accommodate. Of utmost importance is the need to be FULLY independent with one’s luggage. Most of our chosen hotels will provide baggage handling service (included in your tour, if available), but you must be able to FULLY manage your things in airports, rail stations (which can be large and feature stairs), and in getting on/off trains, which feature very narrow aisles and limited space for storage. There is no one to help in these situations and your Tour Leader and other travellers cannot be relied upon to help. In your travels you'll meet two kinds of tourists — those who pack light and those who wish they had! Our hotel choices will range from modern 3-4 star international class hotels in most towns and cities, to simpler mid-range properties in smaller centres, and unrated inns/lodges in the Arctic. If you click on the “Map & Hotels” tab above, you will see that Russia has come a long way since Soviet times, and our hotel stays promise to be comfortable, well-located, modern properties with international-class amenities. This tour was designed by, and will be led by, Senior Tour Leader Jonathan Hodgson. We will also have multiple local drivers and step-on Russian guides at each location along the way.